GoPro Karma is the first drone from the company and it has not had the smoothest of launches. Shortly after its release it was recalled due to a battery housing fault. But GoPro responded well to the issue by replacing all units and giving away free GoPro Hero 5 cameras as compensation to its early adopters. 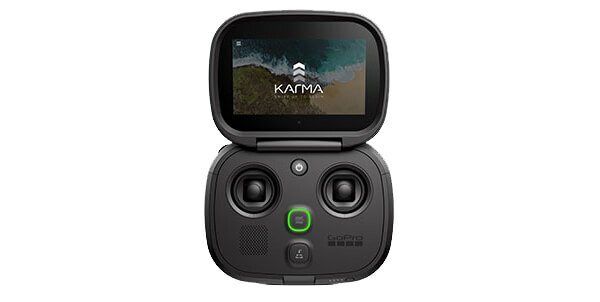 The concept of the Karma Drone is that it is an all-in-one shooting solution, it comprises of the GoPro Karma , Karma Controller, Karma Grip , Karma Backpack and the Hero camera. The Karma Grip slots in to the main Karma Core and has adapters to hold the GoPro Hero 4 / 5 and Session camera (additional adapters will cost extra). The The GoPro Hero 4 / 5 / 6 Black are capable of shooting 4k video at 30fps as well as 12 megapixel stills. The newer Hero 6 offers some useful extra features like digital stabilisation, voice controls and a none fisheye shooting mode. The controller is a clamshell style unit with a built-in 5 inch 720p screen and simple controls and a battery life of up to 4 hours. Having the standalone controller frees up your phone to run the GoPro Passenger App to get a second first person view of the drone. The GoPro Karma itself can fly up to 35mph and 3000 metres from the controller with up to 20 minutes flight time. The body of the drone has a great foldable and portable design.